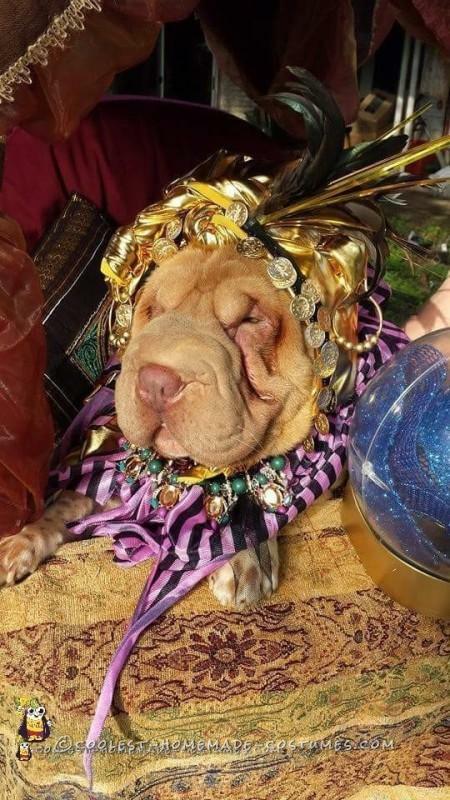 Here’s a fortune teller dog costume for Lulu, my 3 year old miniature Shar Pei. It was the night before A SPCA Halloween adoption event. I wanted to make something different then what you buy at the costume stores. I went to Walmart and bought a small scrap piece of gold material ($1.00) and a strand of charms (50¢). I tied it around her head and made a scarf-like headpiece. I found some feathers in a wreath I got from a garage sale (50¢). I used two curtain rings from my bathroom and used them for fake earrings. I cut up a skirt that I had for her dress top. This was a no sew project. I found a old cheep necklace in my jewelry box. 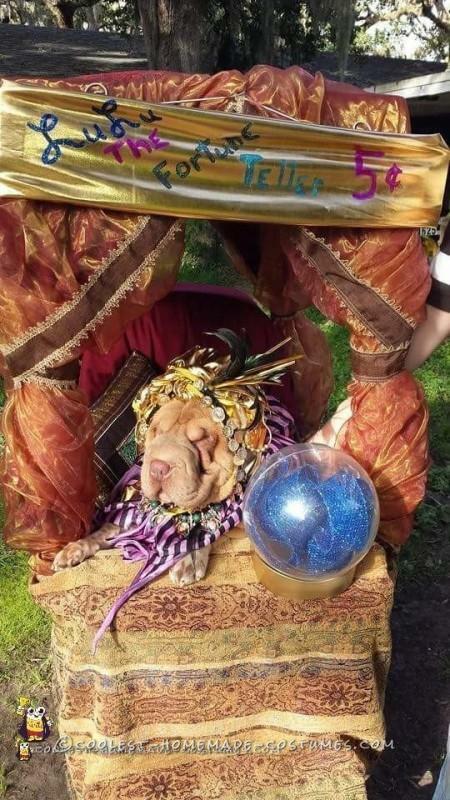 The hardest part of this fortune teller dog costume was trying to make the magic Crystal ball, so I used my kids toy ($5.00) that was a brain plastic globe thing and broke the brain out and stuffed a blue glittery ribbon ($2.00) and you can’t see in the picture but I took a blinking holiday plastic cup ($1.00) and took the light blinker out and put it in the bottom of the globe to blink the different colors through the ribbon. My friend was getting rid of a old baby stroller (free). My husband used wood scraps from the garage and made a frame for the top of the stroller and I took my house curtain and wrapped it all around the stroller to look like a booth. I used nail polish to write her name and title on the extra scrap gold material. We nailed a piece of small thin wood to the front to hold the magic Crystal ball (nailed the Crystal ball base to the wood so she would not knock it down) and it was a place to rest her paws on. I put my dog in the stroller with the baby straps to see if she would even ride in it after all that work and she loved the ride! So it was 9:00 at night when we got started and I got a little more creative about 3:00 am with the whole set-up. We finished about 5:00 in the morning and it turned out better than I had pictured in my head. It was so worth the time to make it from scratch for the response we got at the SPCA Halloween adoption event costume contest. 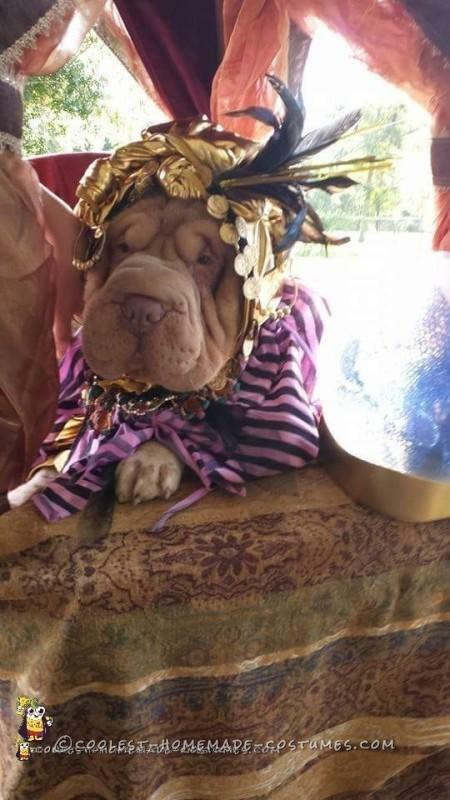 The best part of the whole project was she won First place with her fortune teller dog costume and it was a cool homemade costume that cost me $11.00 to make.